Pursuant to the Regulation (EU) 2016/679 of the European Parliament and of the Council of 27 April 2016 on the protection of natural persons with regard to the processing of personal data and on the free movement of such data, and (hereinafter referred to as „GDPR“) University of Ostrava provides data subjects (natural persons) with this information relating data processing and data protection in respect of the academic (scholarly) journal Communications in Mathematics. University of Ostrava provides data subjects (natural persons) with information relating data processing and data protection in order to comply with the legal obligations stipulated by the GDPR. University of Ostrava provides data subjects (natural persons) with general information relating data processing and data protection through its public website, which could be accessed by URL address https://www.osu.cz/gdpr. University of Ostrava provides data subjects (natural persons) with more specific and detailed information relating data processing and data protection via its particular bodies (departments, faculties, institutes, and facilities) and/or via their constitutive bodies (departments, centres, sections, and units). University of Ostrava is the controller of all personal data which have been obtained (received, transferred) by her. University of Ostrava is a legal person, a public university established by the Act no. 314/1991 Coll., ID no. 61988987, address of headquarters (rectorate) Dvořákova 7, 701 03, Ostrava, Czech Republic. University of Ostrava has designated Jan Humpolík as its own data protection officer (DPO). Anybody, whose personal data are being processed by the University of Ostrava, has the right to contact data protection officer with regard to all issues related to processing of personal data and to exercise of rights under the GDPR. Name, second name, surname, maiden name, former name. E-mail address (both personal or affiliated with or provided by parent university or institution). IP address, date and time of communication via internet. University of Ostrava processes only such amount of personal data necessary for attaining the specific purpose or legitimate interest. University of Ostrava does not process any personal data which are clearly unnecessary for attaining the specific purpose or legitimate interest. University of Ostrava ceases to process any personal data which have become demonstrably unnecessary for attaining the specific purpose or legitimate interest. University of Ostrava provides authors of academic papers with access to peer review system pertaining the journal via journal editors. Every prospective paper is sent together with certain data listed in section 7 of this document to he editor. The editor then decides on whether he or she is qualified in the field (topic) of the sent paper. If the editor concludes that he or she is fully capable of executing rigorous peer review of the sent paper, he or she will proceed the said procedure personally. If the editor finds that his or her qualification and experience does not meet the field (topic) of the sent paper, he or she will submit the sent paper to another editor or external collaborator of high scholar level. The mentioned scenario results in transfer of both the sent paper itself and the personal data listed in section 7 of this document to certain external scholar (expert). The personal data listed in section 7 of this document, namely Identification and Contact data, are personally processed by the journal editors and external collaborators (scholars) solely for the purpose of contacting the respective authors of the paper in order to seek their clarifications or additional information about their reviewed work. The personal data listed in section 7 of this document, namely Identification and Contact data, are sent together with of the article text itself to the publishing house in order to execute graphic and typesetting procedures and indexing the article in abstracting & indexing databases (such as Scopus). The personal data listed in section 7 of this document, namely Identification and Contact data, are published as an integral part of the text of the article in the journal and are indexed by A/I database. 30 days starting with the moment of initiation of communication between the University of Ostrava and any person by electronic means, especially by e-mail or telephone. University of Ostrava obtains only such personal data listed in section 7 of this document, which are identified as “Communication Data”, in the aforementioned manner. Obtaining of personal data cannot be prevented by any technical means because it is an essential feature of the electronic communication and thus its inevitable consequence. University of Ostrava stores these personal data for the period of time usually not exceeding one week, in exceptional cases not exceeding 30 days. The period of public availability starting with the moment of publishing the paper (article) both in physical (paper) and electronic form. University of Ostrava stores such personal data listed in section 7 of this document, which are identified as “Identification Data” and “Contact Data”, for as long as the published paper (article) is available for public, therefore for indefinite period of time. This term encompasses all public order and criminal investigation bodies and agencies (police, public prosecutors, courts of law), financial administration (tax offices and directorates), customs administration (customs offices and directorates), other public authorities (ministries, government departments and agencies, offices, and inspections). University of Ostrava sends personal data to the aforementioned public authorities only if this processing is necessary for compliance with the legal obligation to which the University of Ostrava is subject and only in the extent and manner defined by the laws and regulations. Publisher (publishing house). 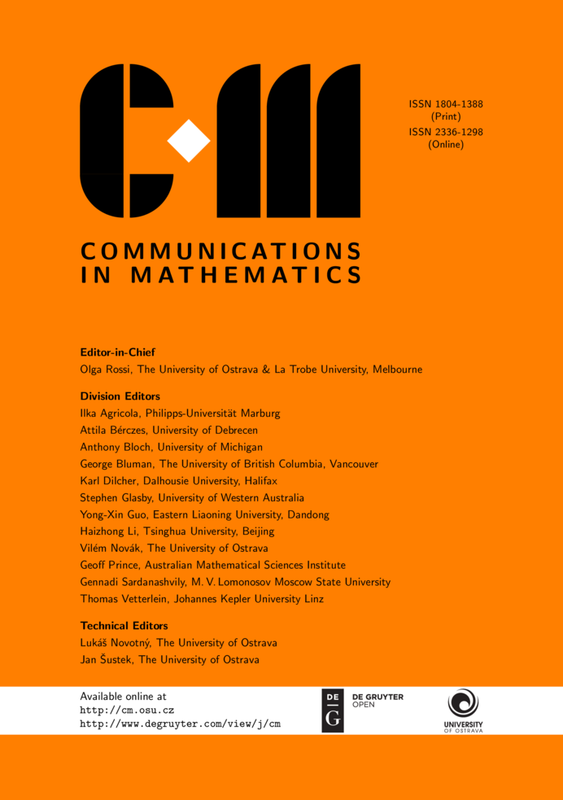 University of Ostrava sends all papers (articles) selected for publication in the journal Communications in Mathematics to the publisher. This processing of personal data is necessary for publisher to execute graphic and typesetting procedures and indexing the article in A/I databases. External scholar (expert). University of Ostrava sends personal data attached to the paper (article) to the external scholar (expert) in order to facilitate peer review procedure under the terms described in the section 10 of this document. These external scholars (experts) may be located in third countries, i. e. countries, which are not member states of the EU. Necessity for the performance of the contract. University of Ostrava processes all obtained personal data in order to enter into a contract with the author of the article (paper). Under the terms of this contract all subsequent activities listed in section 9 of this document are performed. As the processing of the personal data is inevitable condition for concluding the contract, the lawfulness of this processing is upheld. Necessity for purposes of legitimate interests. University of Ostrava processes all obtained personal data in order to publish its scholarly journal together with all activities attached to, especially peer review procedure and indexing. As the processing of the personal data is inevitable condition for any academic endeavour and University of Ostrava is undoubtedly an academic institution, the personal data processing constitutes its legitimate interest, and therefore its lawfulness is upheld. Act no. 101/2000 Coll., Personal Data Protection Act, as amended. The aforementioned rights could be exercised via Data Protection Officer of the University of Ostrava, whose contacts are listed in section 6 of this document.